Paris (AFP) - The largest ice shelf in the Antarctic peninsula is being thinned by warmer seas and air and could catastrophically break up, scientists said on Wednesday. The loss of the Larsen C ice shelf could occur within a century but an earlier collapse cannot be ruled out, with major consequences for global sea levels, they said. "We now know that two different processes are causing Larsen C to thin and become less stable," said Paul Holland from the British Antarctic Survey (BAS) who led the new research. 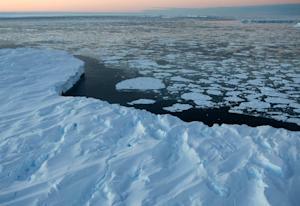 "If this vast ice shelf... was to collapse, it would allow the tributary glaciers behind it to flow faster into the sea. This would then contribute to sea-level rise." Ice sheets are vast floating beds of ice attached to the Antarctic coast. Hundreds of metres (feet) thick in places, they are extensions of land ice sheets and are fed by glaciers. Larsen C is the fourth largest ice shelf in the world, covering around 55,000 square kilometres (21,235 square miles), or nearly twice the size of Belgium. Two far smaller companion shelves on the eastern side of the peninsula -- the tongue that juts from Antarctica towards South America -- have collapsed in the last two decades. The first, Larsen A, was lost in 1995. In 2002, this was followed by Larsen B -- at 3,250 sq. km, the size of the US state of Rhode Island. The Larsen B event had no precedent since the end of the last Ice Age, around 12,000 years ago, according to glaciologists. It tallied shockingly with the discovery that the peninsula is one of the fastest-warming places on the planet. Temperatures there have risen by around 2.5 degrees Celsius (4.5 degrees Fahrenheit) over the last 50 years, several times the world average. Published in the journal The Cryosphere, the new study combined data from satellite measurements and eight radar surveys over 15 years, from 1998 to 2012. It found Larsen C had lost an average of four metres (13 feet) of ice during this period, and had lowered by an average of one metre at the surface. Warmer seas are gnawing at it from below, while a warmer atmosphere is causing air to be expelled from the soft, honeycomb surface snow, called firn, the researchers believe. As a result, the ice on the surface is becoming more compact and dense, which stresses and weakens the shelf's internal structure. Despite "considerable" uncertainties, there is cause for concern, said the authors. "A collapse could occur within a century, although maybe sooner and with little warning," the BAS said in a press statement. 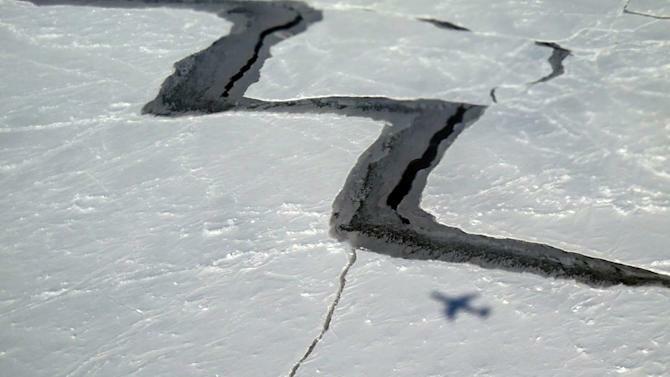 "A crack is forming in the ice which could cause it to retreat back further than previously observed." The problem would come from the glaciers, which would lose the coastal "brake" on their flow towards the sea. More land ice would reach the ocean and melt, adding to its volume. "When Larsen A and B were lost the glaciers behind them accelerated and they are now contributing a significant fraction of the sea-level rise from the whole of Antarctica," said the BAS' director of science, David Vaughan. "Larsen C is bigger, and if it were to be lost in the next few decades, then it would actually add to the projections of sea-level rise by 2100." It projected that warmer seas and ice loss would drive up the global mean sea level by between 40 and 63 cm by 2100, but as much as 82 cm at the top end of scenarios for greenhouse-gas emissions. For coastal-dwellers, the implications of sea-level rise are many, and none is good. They include flooding from storm surges, loss of farmland and salt intrusion into groundwater.